I. What is a Metaphor? Metaphor (pronounced meh-ta-for) is a common figure of speech that makes a comparison by directly relating one thing to another unrelated thing. Unlike similes, metaphors do not use words such as “like” or “as” to make comparisons. The writer or speaker relates the two unrelated things that are not actually the same, and the audience understands that it’s a comparison, not a literal equation. The word comes from a Latin phrase meaning “to carry across,” and a metaphor does just that—it carries a shared quality or characteristic across two distinct things. Writers use metaphor to add color and emphasis to what they are trying to express. For instance, if you say someone has “a sea of knowledge,” you are using a metaphor to express how smart or educated they are. “Knowledge” and “the sea” are not literally related, but they are figuratively related because they are both immense things that are difficult to measure. By putting them together, you can accentuate how vast a person’s knowledge is. A lot of common expressions are metaphors, and this includes phrases like “heart of gold” or calling someone a rat, snake, pig, or shark. These figurative expressions are so widespread that we rarely stop to think about them – but unless you literally think that someone has gills and fins, you’re using a metaphor when you call that person a shark. Clearly, Einstein wasn’t talking about a literal tree. But he’s showing a close relationship between different topics by suggesting that they’re all part of the same living thing. 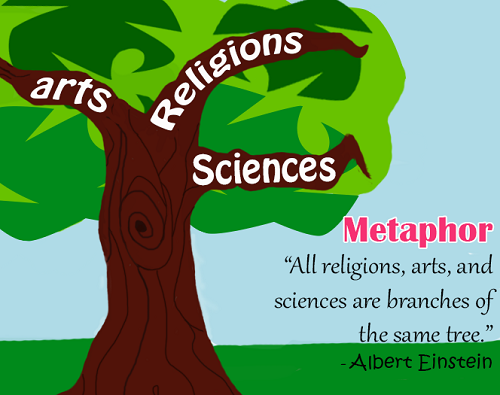 He also basically raises an interesting question – if art, religion, and science are all branches, what should we call the tree’s trunk? That football player is really putting the team on his back this evening! Football commentators use this phrase all the time when an entire team appears to be depending on its running back. The image of a single man running hard with a whole football team on his back is an expression of hard work and dedication. She was a rock star at our last business presentation. This is probably not referring to a literal rock star falling from space or the other common metaphor: a musician performing at a rock concert. Instead, it simply means the person delivered a great performance at the meeting and stood out like a rock star on the stage. Like other forms of comparison, metaphor adds powerful detail to your writing. By bringing in sensory details in the form of metaphors, you can make your words more interesting and real, and help the readers imagine and even feel a scene or character. A good metaphor also exercises the reader’s imagination – it helps him or her see familiar concepts in a new way, or helps explain an otherwise vague topic. Because metaphors are so common, you may find that they have all sorts of effects. This is part of what’s useful about analyzing them! You can take each one on its own terms and figure out how it works within its own specific context. And, as we’ll see in the following sections, there are plenty of metaphors that authors use as a sort of reflex – when someone says they have a “broken heart,” they aren’t necessarily employing metaphor deliberately. Sometimes, they’re just looking for a common figurative expression. This is one of the most famous metaphors in all of English literature. Obviously, Juliet, is not literally the sun, or Romeo would burn to death. The effect of using metaphor here is similar to the effect of simile, but stronger. Because Romeo doesn’t insert “comparing” words into his line, we get the sense that he is really stunned by Juliet’s beauty. She is, for him, just as radiant as the sun. This has more or less the same meaning as other overused metaphors like “tip of the iceberg” or “mere shadows.” What’s seen and heard in the world is just a tiny fraction of what’s going on below the surface. But this metaphor is far more creative and original. It also has the benefit of being extended to two separate comparisons within a single unmixed metaphor: words=crumbs AND mind=feast. Sometimes, the meaning of a metaphor is not clear. Sylvia Plath’s poem Metaphors is full of figurative language like this one, whose meaning is not clear. In general, the poem is about Plath’s pregnancy, so this line may refer to her morning sickness (green apples can be sour and highly acidic, and a bag of them would certainly upset your stomach!) But the act of eating so many apples is strangely overindulgent, which adds a different view to the metaphor. What, on this metaphor, was the ravenous hunger that caused Plath to eat so many apples? This one is very much open to interpretation. This cryptic phrase from Disney’s Aladdin refers to the hero of the movie as a “diamond in the rough.” Obviously, Aladdin is not literally a diamond in the rough – but he’s like one in that he’s scruffy and unpolished. But with a little work and polish, Alladin and a diamond in the rough can be great. Throughout the movie, there are frequent metaphors comparing jewels and gemstones to human beings, though most are more subtle than this one. Again, an extended unmixed metaphor is often more effective than a simple one. These lyrics paint a whole picture of the world within the metaphor of a nightclub – which is especially effective since the song itself was often played in nightclubs, allowing dancers to connect their moment-to-moment experience with larger ideas. One of the characters in The Fault in Our Stars uses cigarettes as a metaphor for his relationship to death. He puts them in his mouth, but never lights them. The idea is that this makes him more comfortable with his own mortality without actually bringing him any closer to dying. Simile (also called “analogy”) is very similar to metaphor – so similar, in fact, that they’re often confused! But there’s a key difference: similes use explicit comparative language such as “like” and “as” to show a relationship between two things, often in the form of A is like B or A is as (adjective or adverb) as B. In this way, similes can be literally true, whereas a metaphor is not literally true. Metaphor: All the world’s a stage. Simile: All the world is like a stage. Metaphor: My heart is a lonely hunter. Simile: My heart is like a lonely hunter. Metaphor: She was a wildfire of rage. Simile: In her rage, she was as deadly as a wildfire. The last simile is an exaggeration, so it’s not literally true – but the comparing language still makes it different from a metaphor. Personification is a figure of speech in which the author describes an inanimate object as if it were behaving in a human-like way. Metaphors and personification are related because with both devices, one idea stands in for another. For instance, if you say “lies can’t run very far,” this is a metaphor expressing that lies don’t last long, but it is also personification in that it describes lies running like people. The door shrieked as it was opened. The town huddled against the foot of a steep cliff. Small fires raced through the forest. Obviously, doors don’t literally shriek, towns don’t huddle, and fires don’t race; people do these things. But personification adds sensory detail and makes these sentences more vivid. Allegory is a literary and rhetorical device that is essentially a complex, extended metaphor. To employ an allegory, an author uses a person, thing, image, or idea that, when interpreted, expresses hidden, symbolic, or secondary meaning. For example, George Orwell is well known for using this technique in his book Animal Farm, where the pigs on the farm are an allegory for important political figures from the Russian Revolution. A metaphor is generally just a phrase, but an allegory “extends” a metaphor (i.e. pigs as politicians) by drawing it out and using it to convey more complex beliefs or ideas. Because they sound similar, people often confuse metaphor and metonym. In truth, these two things are almost opposites of each other. While both metaphor and metonym replace one thing with another, a metaphor applies an unrelated term to something, while a metonym uses a related term to replace another. In other words, a metaphor provides a substitute idea, and a metonym provides an associated idea. Often, a metonym is a smaller part of something–for example, if you get a new car, you may say you got “new wheels”–wheels are not a metaphor for the car, but an associated part of the car that represents the whole. The British fleet was thirty sails stronger than our own. Here, sails stand in for ships; the sails are not a metaphor for ships. They stand in for the word “ship” because they are actual part of a ship. Washington is now in talks with Beijing to coordinate a new trade policy. This is an extremely common metonym in newspapers and foreign policy circles. The sentence is really talking about the national governments of China and the USA, but it uses the names of those countries’ capitals as metonyms. My father had about a dozen hired hands working on his farm. Another very common expression, in which hands stand in for workers (note that each person only counts for one hand, not two.) Again, “hands” are not a metaphor for workers, but they stand in for the word “worker” because hands are what workers actually use to do their trade.